No one goes to hell unless he or she chooses to go there ("And ye will not come to me, that ye might have life" -John 5:40). All you have to do to go to hell is "nothing." If you don't get born-again, you are automatically going to hell ("He that believeth on him is not condemned: but he that believeth not is condemned already, because he hath not believed in the name of the only begotten Son of God." -John 3:18). The Pope made the deadly mistake that so many foolish people make, he ADDED good works to his faith in Christ ("For by grace are ye saved through faith; and that not of yourselves: it is the gift of God: Not of works, lest any man should boast" -Ephesians 2:8,9). Salvation is a gift of God ("For the wages of sin is death; but the gift of God is eternal life through Jesus Christ our Lord" -Romans 6:23). Salvation is free, you CANNOT add works to it; otherwise it is not a gift anymore. Please read my article, Are You Really A Christian. Also please read, Good Works Verses Grace. 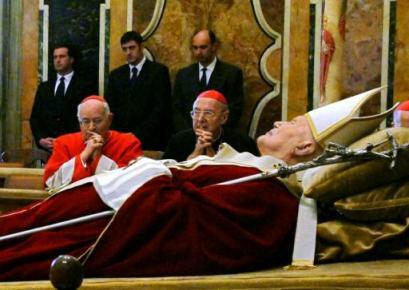 FOX News and CNN have been covering the death of the Pope round the clock. I've heard nothing but lies, heresy and ridiculous comments by many famous people. Clearly George Bush is NOT a born-again Christian! When George W. Bush was running for the office of governor in Texas, he said publicly that a person must accept Jesus Christ as personal Savior to go to heaven. George Bush has claimed publicly to be a Christian. I can say with confidence that George W. Bush is NO Christian! No true Christian would ever praise the Pope as “a good and faithful servant of God” (not to mention the fact that George W. Bush is also member of the eerie occult groups, Skull and Bones and Bohemian Grove). It's disgusting to hear professed "Christians" like Billy Graham and Robert Schuller praising the Pope. It's hard to believe that Billy Graham was actually once a board member of the Sword of the Lord in Tennessee. Billy Graham is a sell-out and the pioneer of the ecumenical movement. Bush Sr., Bush Jr., Bill Clinton, Jimmy carter, Nancy Reagan...all praising Pope John Paul II...does anyone believe the Bible anymore? Does anyone care about the TRUTH? Evidently not in The White House. To be expected, priests from across the world are praising the Pope as the Vicar" of Jesus Christ. Can you show me that in the Bible? No you cannot! No one in the Bible was ever reverenced as "God upon the earth," other than our Lord Jesus Christ (Who in every respect was God Almighty upon the earth, 1st Timothy 3:16). The Pope was a heathen sinner just like anyone else, and he surely was not God's Vicar. The Pope was the Vicar of hell. I say this not to be unkind, but to try to wake you up concerning the TRUTH. The Catholic religion is also guilty of worshipping the dead. There is NOTHING in the Bible leading us to bow unto a statue of Mary. On the contrary, Exodus 20:4,5 commands us NOT to make unto ourselves ANY graven images, nor to BOW to them. The Catholic religion leads people into idolatry and vain worship, teaching for doctrines the commandments of men (Mark 7:6-9). Catholics worldwide bow in worship to statues of saints, such as Saint Anthony. Now they're talking about making Pope John Paul II a saint. Well, if you want to worship the Pope, then you'll have to look down to the ground because he's burning in hell fire and brimstone according the the bible. I just heard a Catholic man from Rome say, " The Pope brought us the gospel of Christian hope." The gospel of Christian hope? You've got to be kidding? The Bible declares the gospel of Christ in 1st Corinthians 15:1-4 (The death, burial, and resurrection of Jesus Christ). So what's with the Seven Sacraments? Why does the Catholic church claim that they ARE Christ, and that baptism is the door into the Catholic church? These erroneous teachings are manmade doctrines which are nowhere found in the Scriptures. Pope John Paul the second was the first Pope to ever visit The White House. President George W. Bush was the first president to ever visit the Vatican in Rome. He was the most traveled Pope. 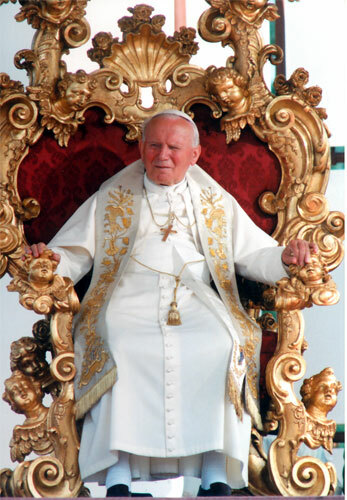 Pope John Paul II was also the first non-Italian Pope in 455 years of Pontiff history (he was Polish). Sadly, of the estimated one million Polish people living in Chicago, 98% are said to be Catholic. According to the Bible, 98% of the Catholic people in Chicago are going to hell when they die. Don't get mad at me, get mad at God because He wrote the Bible. You can get mad at me all you want to...my beliefs are based upon the Bible, not the TRADITIONS of some false religion. Show me anywhere in the Bible where you're supposed to go into a confessional booth to confess your most innermost immoral secrets and sins to a priest (just another dirty, rotten sinner). The Bible teaches no such nonsense! We are supposed to confess our sins to Jesus Christ alone (1st John 1:9). The Catholic religion is of the devil, and it's leaders are the sinister ministers of Satan. The Pope was nothing like my Saviour Jesus Christ...Jesus spoke the TRUTH and made no apologies for it. The Pope never warned anyone about hell-fire. Jesus spoke of weeping, wailing, and gnashing of teeth in hell. Jesus didn't just visit the poor and needy...he actually helped them. How much money has the Vatican given to world's poorest? Nearly 3,000,000,000 people live on less than $2 a day. The Pope toured all around the world, but what did he do to actually help those people? Nothing! Why is it that the Vatican in Rome is so filthy rich, while the poor stay poor? The next Pope may very well be the False Prophet who will accompany the Antichrist to rule the New World Order. Earlier today I heard former Secretary of State, Madelyn Albright, say that the Pope had given people the sense that "those who believe in God are united a certain particular way." In other words, "it doesn't matter what you believe." Talk about one-world religion! The Devil desires to consolidate everything to prepare the stage for the coming Antichrist. We are witnessing the formation of the New World Order—which will be composed of a one-world government (a confederate), a one-world religion (ecumenicalism), a one-world economy and money system, to form a global police-state. Surely, the return of the Lord Jesus cannot be far away. Even so, come Lord Jesus! "It is without question that John Paul II, former head of the Roman Catholic Church, spoke strongly to many of the moral issues of our day, from protecting unborn children and marriage to voicing opposition to stem cell research and human cloning. However, he was a fallible man, like the popes before him, who rejected the authority of Scripture in favor of a religious system based on the doctrines and traditions of men. Christians must not be led into pledging allegiance to the deceased pontiff, but should pray for the Catholic and Protestant people who are far from biblical teachings, and are now leading the effort to embrace ecumenicism." Catholicism is a lie of the Devil. If I didn't sincerely care about people, then I wouldn't take the time to WARN you. The Catholic religion is all a bunch of Satanic lies based upon manmade traditions. I plead with you as a friend, obey the Bible by turning to the Lord Jesus Christ in faith. Salvation is NOT found in any religion; but in a Person—the Lord Jesus Christ! You need Christianity friend, NOT churchianity. It Pains Me | One Mediator! Priests and Boy Scouts | The Catholic Church is a Big Hoax! 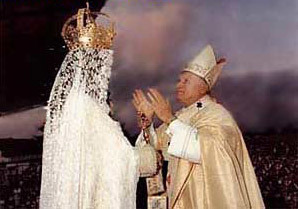 Pope Commits Idolatry | Sacred Immaculate Heart of Satan! Praying to Mary | Roman Catholicism Exposed!